Purchase a copy of this hit Israeli movie, nominated as the Best Foreign Film at this year’s Oscars. Acclaimed director Joseph Cedar has produced another masterpiece in this tale of a father and son’s academic rivalry, not to be missed. NEW RELEASE :Hebrew with English Subtitles. The awards speak for themselves. Footnote has already been crowned Best Screenplay at the Cannes Film Festival and is now one of the main contenders for the biggest prize of all, Best Foreign Language Film at this year’s Oscars. 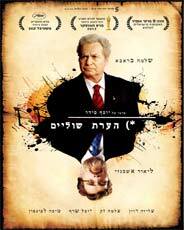 Written and directed by the country’s premier film-maker Joseph Cedar, this is a beautifully made Israeli film which has received top class reviews. As well as being father and son, Eliezer and Uriel Shkolnik (played by Shlomo Bar-Aba and Lior Ashkenazi) are rival professors of Talmudic Studies. When it becomes clear that Eliezer is to receive recognition for his work, their already complex relationship becomes all the more intense. Portraying such an intricate and complicated relationship requires the kind of cinematic skill that only someone such as Cedar can provide. The 43-year-old is the jewel in the crown of the Israeli film industry and was the brains behind two other hit Israeli movies. He produced Campfire in 2004, before making Beaufort in 2007, which landed him a Silver Bear award at the Berlin Film Festival. Beaufort was also the first Israeli film to be nominated for an Oscar in 24 years portraying the fraught service of Israeli soldiers in Lebanon. Cedar’s films are often a delicate portrayal of issues within Israeli society. Given his prior success, many wondered whether Cedar would be able to retain such high standards of film-making. However, Footnote is set to become not only Cedar’s greatest triumph, but one of the greatest Israeli movies of all time.